There are a few common stereotypes of freelance writers that exist today. Go into any coffee shop and you’ll find a freelance writer guzzling coffee and typing away at their laptop. You can also find freelance writers in the form of stay-at-home moms who bang out work while their children nap. 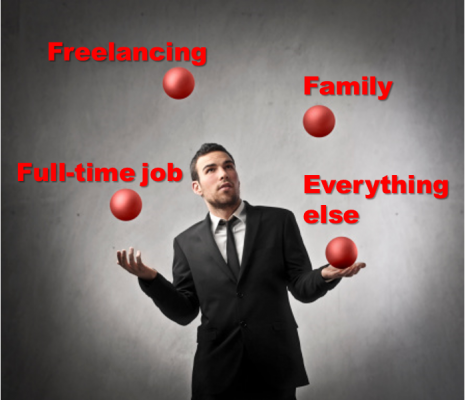 Many freelancers fit into these categories, but not all of them. Some of them are more like me. I’m a freelance writer, but I’m also a full-time working stiff. From 8 AM to 4:30 PM, I’m a regular Joe at a corporate office. When I’m not at work or watching my kids, I’m hunting down jobs, writing articles, communicating with clients and doing all of the other grunt work that comes with being a freelance writer. And there are quite a few others out there who burn the candle at both ends, who do freelancing on the side of a (hopefully) successful career. Having spoken to many full-time freelancers, I’m all too aware of the differences in our lifestyles. They tell me they can’t imagine how I’m able to do both. Just the same, I tell them I don’t know how they can put up with the rigors of freelancing all day, every day. That said, there’s plenty of common ground between the two camps. Here’s a look at the life I lead and how it compares with that of your typical full-time freelancer. There’s very little in life that’s more difficult than working a full day, doing stuff with your children, and then having to turn it back on and be productive after they go to bed. And yet, that’s the lot that many of us are stuck with. It’s not an easy trick to pull off. But it’s far preferable to working the night shift at a grocery store. The truth is, every freelancer has his or her own juggling act. Whether it’s young children during the day or family members at night, it’s tough to find quiet time to work, especially when people derisively assume writers aren’t doing “real work”. Even though some of us work during the day and some of us don’t, we’re all in the same boat when it comes to struggling to find time to get things done. Freelance writers are usually paid by the word, but that’s not exactly the case. Sure, they get paid by the word for the work they submit. But that payment is also compensation for the time it takes to track down leads, deal with clients and send in revisions, not to mention time spent away from family and friends. The nature of freelancing means that work-related functions often seep into hours when we’re not working. As a full-time worker during the day, that’s a tough pill to swallow. It’s very easy to miss out on jobs and opportunities because it’s just not possible to be everywhere at once. As a result, those of us who work full-time have to work even harder to make up for the limited resources we can commit to the job. Because time is at such a premium, it becomes extremely tempting to get some writing done while at work. On the surface, it makes a lot of sense. People always take time to browse the Web and check their personal email, and they never get in trouble. Why not bang out a quick article when nobody’s looking? After all, people will see you typing and just assume you’re drafting an email for work-related purposes. The problem is that it’s a very slippery slope. What begins as getting a head start on the night’s work easily turns into relying on that down time at work to write. When that down time doesn’t come, you could be in a real pickle. If you’re banking on having an hour of free time to write in order to make a deadline, you very well could end up missing that deadline and alienating that client. Worse, you could get caught, which could easily result in you losing your job. No matter how you slice it, this isn’t a risk worth taking. Nobody should feel sorry for those of us who try to have their cake and eat it too. We’ve chosen to lead a double life, even if it cuts into our personal time and creates some uncomfortable temptation while at the office. But at the end of the day, it’s not so different from the life that full-time freelancers lead. We all have our crosses to bear and obligations to overcome. Instead of debating which side has it easier, we should embrace our differences and learn from each other so that we can all become better freelancers. Bryan B is a freelance writer based in Long Island, N.Y. He is passionate about bad movies and bad puns, and he still thinks pro wrestling is real.